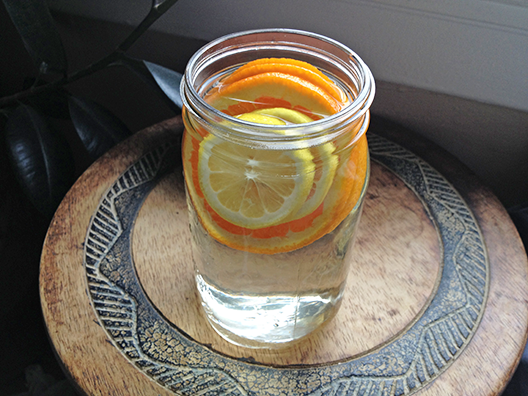 So fresh and citrusy, this water is an everyday favorite. The water’s flavor has the sweetness of orange juice but without the added sugar. 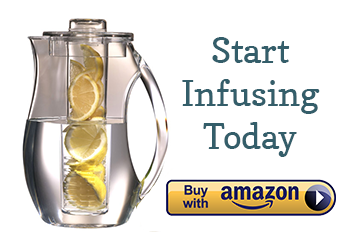 You’ll love it, especially if you are seeking an intensely flavored infused water to replace soft drinks or commercial fruit juice. Recipe for a 32 oz Ball jar: 3 orange slices and 2 lemon slices. Squeeze the juice of any end pieces into the mix. Chill for two hours. Hi. I had a my first taste of fruit infused water at a Holiday Inn and enjoyed it so much that I decided I wanted to serve that with cake at my wedding reception. I didn’t really know anything about it, so I looked and found a recipe for orange, lemon and lime water. It said to infuse for 2 hours, but I was going to do it overnight. I am glad that I saw your blog, because I would have had a mess with a bitter taste. I want something pretty, tasty and refreshing and I want to make it the day before the wedding. I bought a bunch of 3 quart plastic jars at dollar tree and I will pour the FI water into punch bowls to serve. I was wondering what you would recommend. Should I go with pineapple and strawberry slices? Or should I do the citrus and just remove the fruit after 2 hours? If I do the citrus, do I need to remove the rinds, if I am only going to infuse for 2 hours? just tried this-so delicious and amazing! i love just adding lemon but sometimes that makes it too sour, the oranges add a special flavor and kick!! How many glasses each day to sip, what kinds portioned foods should eat to keep hour glass fit toned figure? Hello, I was wondering if I can drink it all the time. Like is there a specific amount? Because I was going to drink a lots everyday and I was wondering if that’s not okay? Are there any benifits to this like other infused waters??? Is it necessary to cool it down for 2 hours after mixing oranges inside water? How long we can keep Orange and Lemon (with peel ) in infuser water bottle.